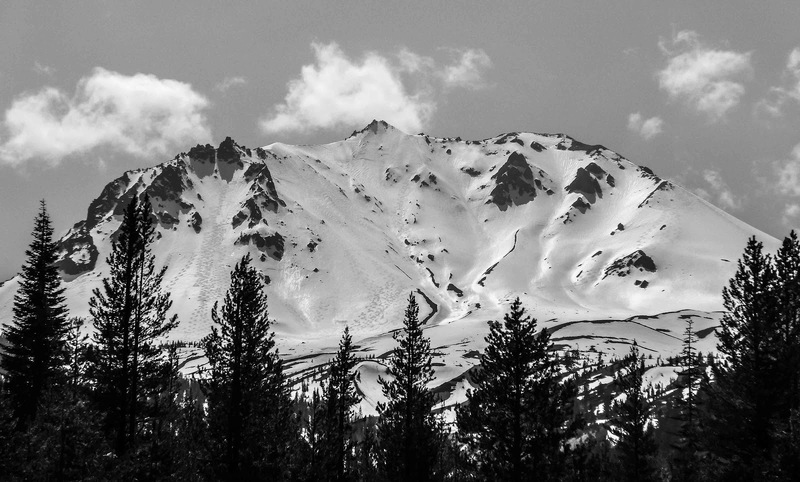 California's Lassen Peak was a favorite of last year's volcano tour. Steep lines, uncrowded slopes, easy access, and excellent corn snow. Despite fighting a chest cold all last week, I was determined to partake in this year's Lassen "corn harvest," so I awoke at 3 AM Saturday morning, and headed south on I-5. By 6 AM I convened with Galen, Phil, and Alyson (all of whom drove from Reno the previous night) at the Emigrant Pass parking lot (6,450') in the Devastated Area of Lassen Volcanic National Park. Around 7 AM we were bootpacking less than a mile of bare ground and patchy snow before donning skins on contiguous snow at 7,000 feet, just above the north bank of Lost Creek. Unfortunately, Alyson was forced to turn around due to equipment issues on her split board, but Galen, Phil, and I trudged on despite very gusty (and dusty) conditions. My lungs were burning with every step due to my lingering respiratory ailment, and I was taking in cough drops for the entire ascent as we battled a persistent gale up to 9,500 feet on Lassen's north ridge. However, the breezy conditions kept the skiing surface firm, and we were rewarded with 2,500 vertical feet of near-perfect corn.